I absolutely adore this dress... And the outstanding customer service was a bonus! This is my first order from your gays...and i just love it so much. The dress is so beautiful. It is definitely a great value for the money. Everyone was suprised it was as inexpensive as it was. The fit was great. Thank you. 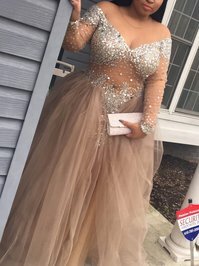 I think this dress is fabulous for my prom and great pricing for amazing quality. We ordered a size 10 and it fits her like it was tailor-made for her. It looks beautiful on her! She is very happy with the dress, which is wonderful as she will be wearing it! I got my dress three weeks after I ordered it. It was really cheap so I was a little skeptical even though Millybridal is a reliable site. I wasn't expecting it to look as good as the picture but it does. When I go to prom again next year I will be using Millybridal. Excellent quality of dress. Arrived very quickly. The dress really worth the pennies considering the quality of material and craftsmanship. Excellent and delivery before expected that saved the day.